An ideal introduction to the Land of the Rising Sun, explore the best-loved highlights of Japan in just a short period of time. 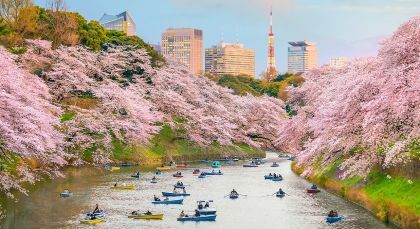 Discover an incredible blend of old world charm and modern innovation in Tokyo, walk past bustling street laden with the best street and gourmet cuisine that the city has to offer, and explore beautiful temples and busy markets. 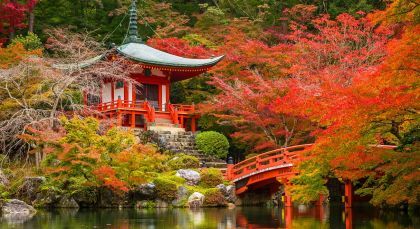 In Kyoto, soak in the incredible culture and heritage with visits to the many UNESCO World Heritage sites dotting the cityscape, discover a sake brewery, and venture to Nara, where important cultural landmarks and heritage sites will take your breath away. Learn the secret tips for creating some of the most loved Japanese dishes in a morning cooking lesson at one of Kyoto’s typical Maichya (traditional wooden townhouses). Japanese cuisine has been declared a UNESCO Intangible World Heritage for good reason, cooked as it is with the freshest ingredients and masterful techniques. Get an overall idea about Japanese cooking styles from your chef in this cooking class designed for a small, intimate group. Learn how to prepare Bento style boxed meals under the expert guidance of your host chef. Cook Kyoto’s signature Shokado bento, a delicious spread that includes delectable bites of tempura, miso soup, egg roll, chicken teriyaki, sesame spinach salad and sushi. The greatest treat awaits you at the end of the class, when you get to taste your own Bento box! (Half Day, Shared Activity & No Transfers; Meal included: Lunch; Fitness Level: Easy; Please inform about any dietary restrictions in advance). Discover a slice of traditional Japan on this tour of a selection of Kyoto’s UNESCO World Heritage sites. Visit the famous Golden Pavilion or the Buddhist Kinkakuji Temple, which was originally built as the retirement home of the 14th Century Shogun, Ashikaga Yoshimitsu. The lovely villa was turned into a temple after his death. Stop by the grand, 16th Century Nijo Castle with its imposing ramparts and spectacular gardens. Reflective of the power and grandeur of the Edo Shogunate, marvel at the castle’s architecture and building features like its intricate sliding doors, ‘chirping’ nightingale floors and secret chambers. Wind up your day tour by fortifying yourself at Nishiki Market, also known as “Kyoto’s Kitchen”. This street food district is lined with innumerable little noodle shops and food stalls selling deliciously fresh seafood, delectable sushi, traditional pickles and sweets. [Half Day, Morning Activity; Fitness Level: Moderate; Please bring comfortable walking shoes].